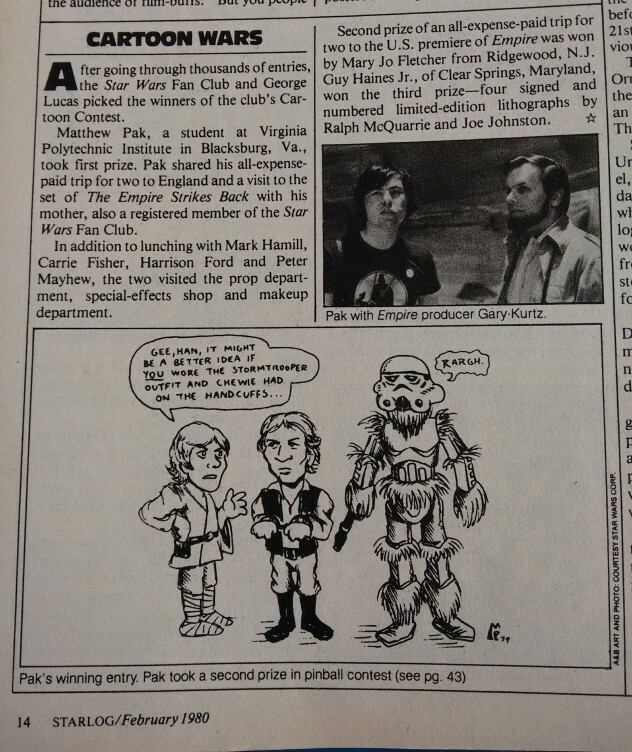 The Starlog Files contains notable moments and excerpts from Starlog Magazine back-issues – from silly advertisements, fondly remembered movie posters, to forgotten projects and illustrations. This time, we’re jumping back to Issue #31 which features Disney’s $30M epic The Black Hole on the cover. I recently read through this piece, and as a big fan of the movie (that ending! those effects! yes please!) found it to be engrossing. There’s even a section where Ron Miller (Disney’s Executive Vice President) speaks about how they were getting hate-mail about The Black Hole’s PG rating. I can only imagine what the letters were like after the film’s releases – with such an intense and bizarre finale. It’s worth reading through the whole article if you’re a fan of the movie. Moving on, there are some pretty great things to sort through in this issue, so let’s get going. It’s no secret that plans to bring the caped crusader to the big screen were long in the works. There was even a late-70s attempt to bring Batman into outer space for one project, when interest in the character was at a particularly deep lull. In 1979, producers Michael Uslan and Benjamin Melniker bought the rights to Batman as a character off DC Comics, in an attempt to realize a gritty and adult vision of the character to stand in stark contrast to the silliness seen on his television-based escapades. 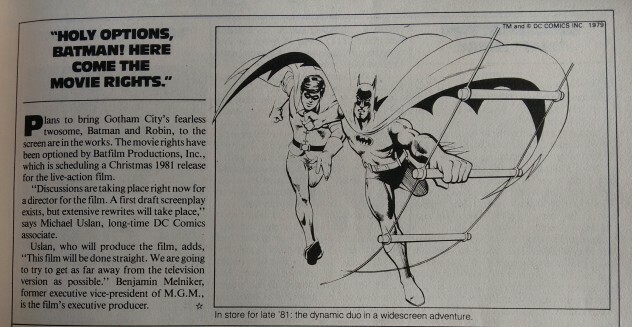 Here, Starlog reports on their announcement to bring a Batman & Robin into theaters in time for Christmas 1981. Of course, the project went on to be unfulfilled, becoming just one in a long list of failed attempts – including an Ivan Reitman directed version with Bill Murray as the main choice to portray Batman! Now that one, I would like to see. It might seem quaint by today’s standards – what with services like Loot Crate and others delivering a box of items to you every month – but this Club Nova service looks to have delivered six sci-fi shirts to subscribing nerds every year for about sixty bucks. Subscribers also would receive a newsletter, and access to members-only events! Also: that sample shirt design totally reminds me of something you’d see on a Space cover. Totally boss! I did a cursory search, hoping to find more information about the newsletter, but didn’t find much. I bet it was pretty great to spot someone wearing a Club Nova shirt on the street, too. 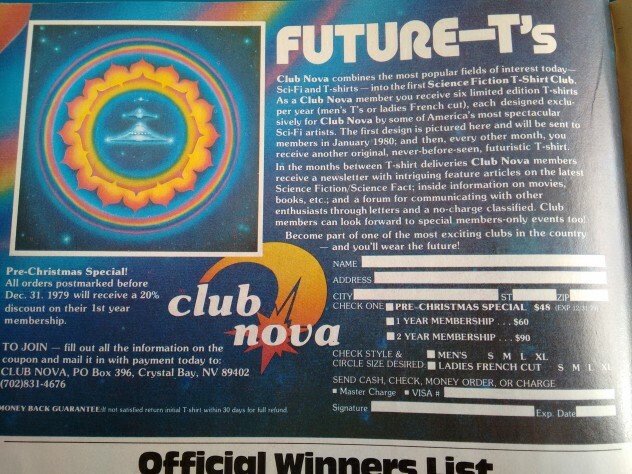 My mind also wonders how many of these Club Nova shirts ended up in thrift stores, only to be discovered by a whole new generation of people who dug on their retro designs. 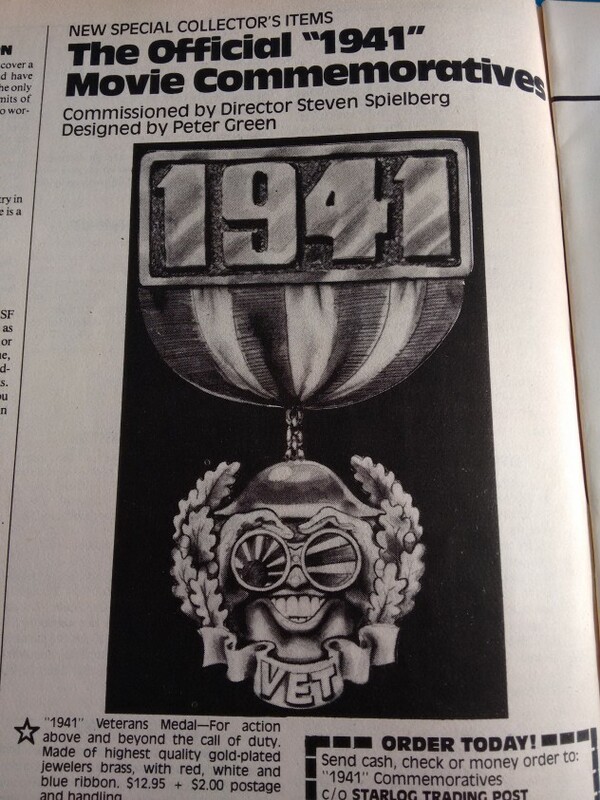 In hindsight, it may be odd to see just how whipped into a tizzy everyone seemed with the release of Spielberg’s 1941 nearing on the horizon. These days, it’s regarded as an over-stuffed and out-of-touch dud by some, or just completely forgotten by others. Personally, I haven’t seen the movie in years, but in college it held a good level of fascination for its combination of bizarre comedy and insane effects pieces. I wouldn’t call it a great film by any stretch, but it’s an interesting and over-ambitious left-turn from Spielberg. As for why Starlog (and a lot of the movie-going public) were so pumped-up: Spielberg was hot off the back-to-back success of Jaws and Close Encounters of the Third Kind, so it’s understandable why the film was getting pushed – and pushed hard. 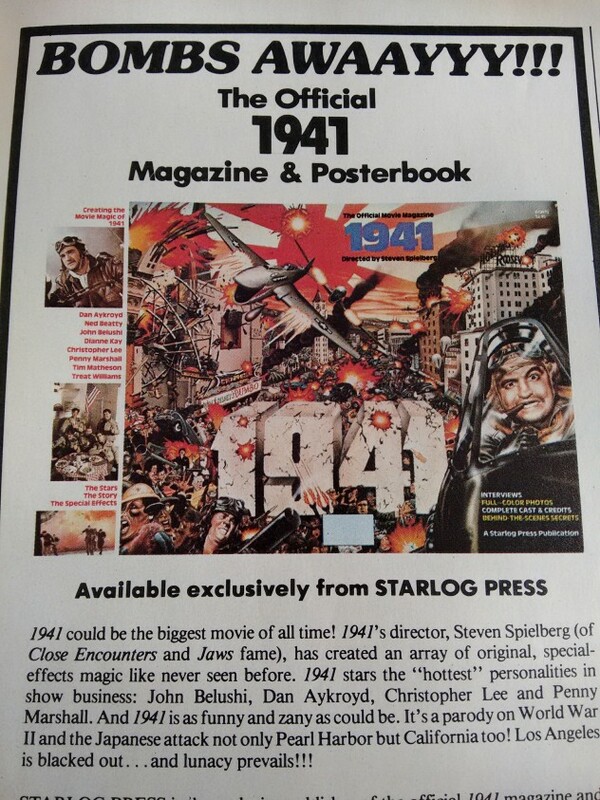 One ad offers commemorative medallions, “olive drab military fatigue baseball caps” and full-colour iron-ons, while Starlog themselves actually sold an official magazine and poster book – seen below. Though the film received mixed reviews (notably, Pauline Kael quoted a friend who claimed it was like “having your head stuck in a pinball machine for two hours”, before going on to call it “great entertainment” herself), Spielberg did go on the record stating he learned a lot while working on the film – specifically about how much control to relinquish to effects crews, something he would keep a tight eye on in the years following. 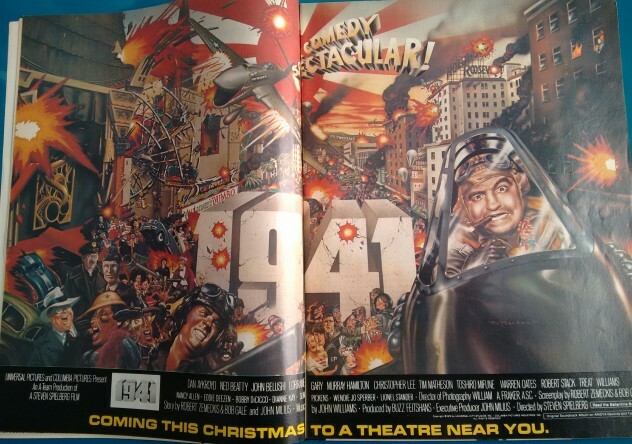 Unfortunately, the film didn’t go on to be the biggest film of all time as the magazine states it could have – although, while most assume it was a major financial dud, it actually wasn’t an out-right bomb. On that note, it would end up making a re-appearance in Spielberg’s ouvre as a literal VHS bomb in an episode of Animaniacs, so that’s pretty hilarious. Finally! Your dreams of wearing a calculator from space! have finally come true – well, came true in 1980, I should say. I gotta say, those tube-based handles and shoulder-straps look supremely uncomfortable. But, they’re made with a silver metallic fabric – just like the real space calculator is…? Maybe? Anyway, I think these items are just delightful, and can only imagine how happy they made some kids back in the ’80s. Hell, who am I kidding? If I had that space calculator backpack, I’d wear it everywhere and constantly offer to do everyone’s “space taxes”. O.K., I don’t have a ton of riffing to do here – I just think these watches are pretty gnarly, if not a bit pricey coming after a backpack for under twenty bones. 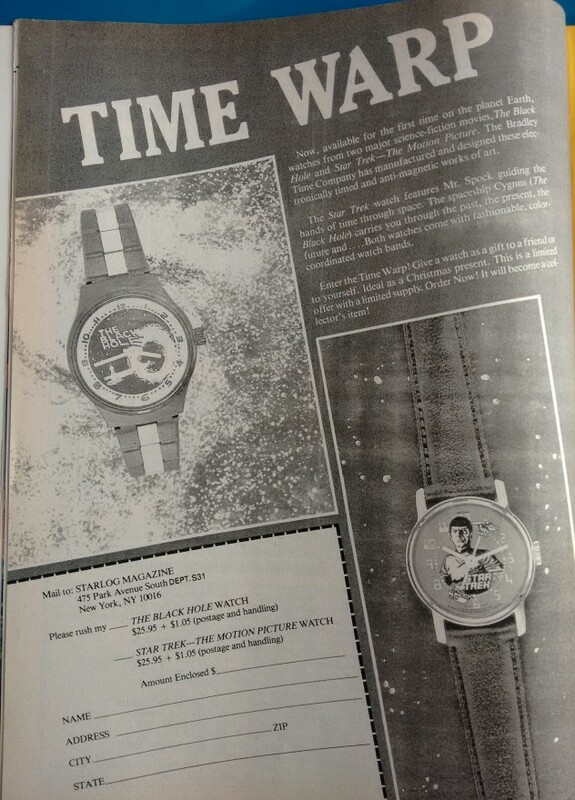 They’re really looking for ways to textually sell these watches, as Spock will “guide the hands of time” on the Star Trek watch and the Cygnus will “carry you through the past, the present, and the future”. I’m not a big watch guy, but that Black Hole one is pretty stylin’! 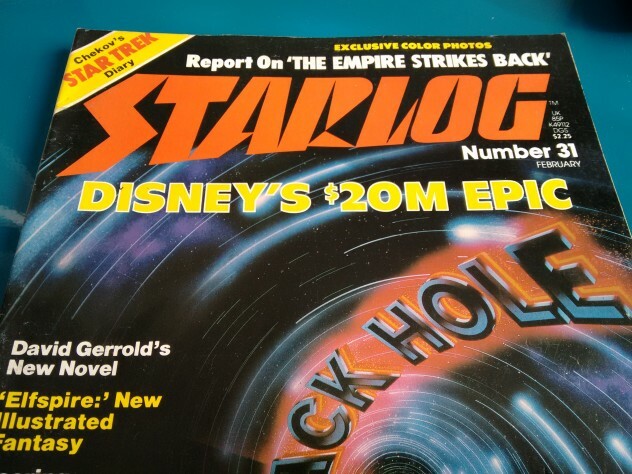 You have to hand it to Starlog, as it seems like every release has issue-specific gear to peddle – obviously Star Trek was a huge deal regardless, and The Black Hole was anticipated in the sci-fi community, but I still find it admirable – from a purely business perspective – that they always seemed to have the right item to sell at just the right time. 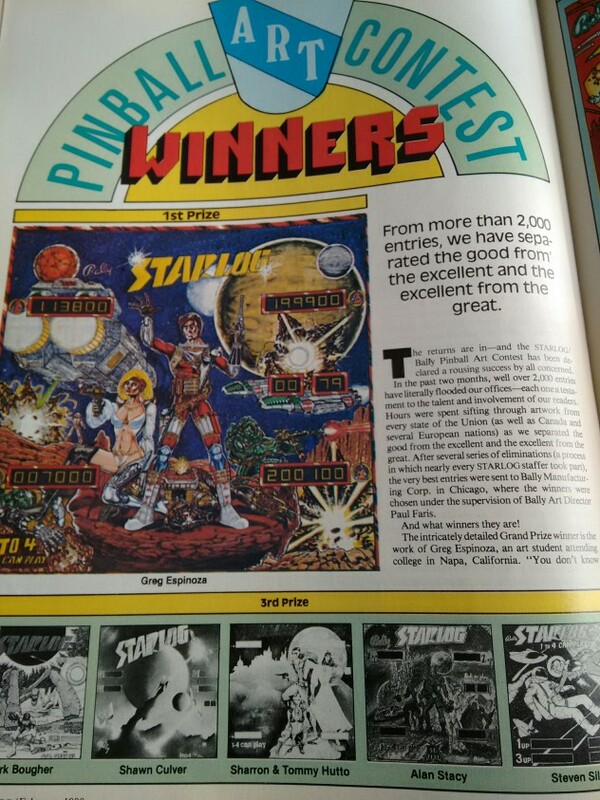 Starlog ran a two-month long contest to design the art for a pinball machine (judged in part by Bally themselves!) and in issue number 31, they revealed the winners. Greg Espinoza‘s work took the grand prize, having taken him a full month to render in pen and ink and then another six days to apply the watercolour highlights. Pretty awesome stuff – but for my money, I really dig Tony Boatright‘s work (seen below). I don’t exactly know why, but something about Tony’s design makes me able to imagine the lights embedded below the art, flickering on and off. Especially that awesome laser-blast and the TILT HIT / GAME OVER section. Greg’s work may be super impressive, but Tony’s screams pinball machine to me – I can almost smell the stale pizza and Coca Cola in the air. I can also almost sense that Billy the schoolyard bully is leering around a corner somewhere, ready to beat me up for my super sweet space calculator back pack. Speaking of contest, how’s this for a grand prize? Matthew Pak won a trip to the Empire Strikes Back set in England after drawing and submitting this quite humorous little comic strip. I love that a slice of fandom as honest and pure as this cute comic won a super-fan such an immense prize. That’s the kinda trip you’d never forget, and I like to think that Pak had some incredible stories to bring back to his friends back home afterwards – dude must have been king of Virginia Polytechnic Institute for a year! 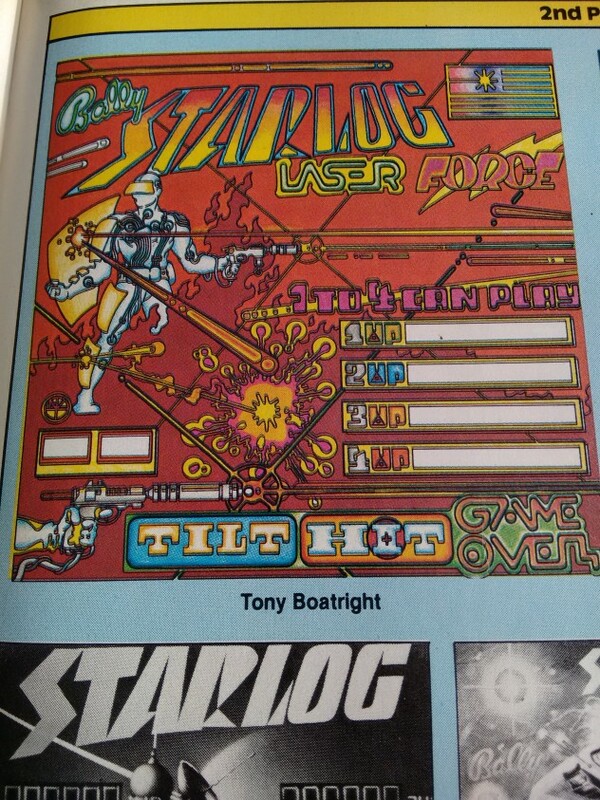 And that’s about it for this round of The Starlog Files. If you have any memories of the magazine, or if these photos reminded you of anything, leave your thoughts in the comments below!